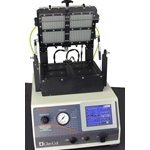 Basic Non-Heated:Nitrogen blow-down systems for drying off solvents. 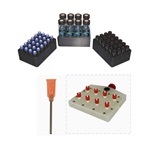 Furnished with lab stand, flowmeter and polypropylene manifold, (8 to 384 positions available). 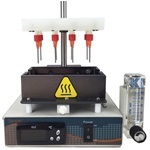 Basic Heated ZipVap: Nitrogen blow-down systems for drying off solvents. Several sizes available (2 and 384 positions) with heating plate. 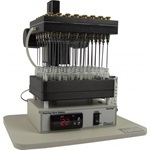 Features a digital temperature control, flow meter, vial insert. 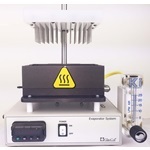 Basic Heated FlexiVap: Nitrogen blow-down systems for drying off solvents and ability to open and close each position. Two sizes available (24 and 48 positions) with optional heating plate. 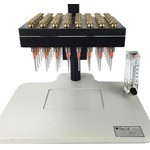 Features a microscope type stand, flow meter and comes with 2 different lengths of needles. 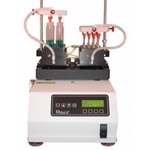 Advanced Heating/Mixing: These systems combine a Nitrogen blow-down system with mixing and heating for the fastest method of drying off solvents in vials to 250ml bottles. Digital interface allows control of speed, time, pulsing and optional auto flow-control. There are many configurations available and custom systems can be designed. BarVap: These are basic blow down Nitrogen systems for small vials. These can be placed on hotplates to heat the gas. Comes with needles, adjustable flow valve and available in 6 and 12 positions.